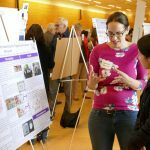 STEP was well-represented at the UW Teaching and Learning Symposium on April 17th, 2018. 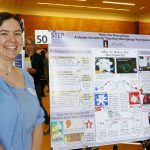 STEP alumni Dr. Eva Ma, Dr. Sarah Morgan, Dr. Suzzanne Mcdermott, Dr. Amy Stone, and Dr. Angela Katsuyama all presented posters about the interactive activities that they had developed with STEP Forward and/or the Pacific Science Center’s Science Communication Fellowship, while Dr. Liz Kwan presented a module that she and her fellow co-instructors had developed for their STEP course. 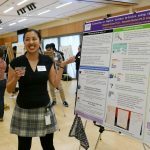 STEP mentors Dr. Salwa Al-Noori, Dr. Becca Price, and Dr. Eva Ma along with Elizabeth McCullough from the Pacific Science Center also presented a poster on our STEP Forward program’s partnership with the Pacific Science Center. 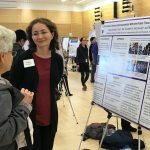 Dr. Liz Kwan explains her poster on the “Evaluation of Popular Science Articles Using the Cited Primary Literature” to Dr. Alexandre Neves (another former STEP fellow). 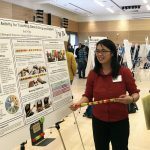 Dr. Eva Ma with her hands-on model of a “gene” that will needs be “fixed” by CRISPR-Cas9. 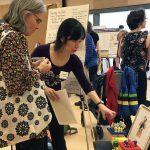 This entry was posted in Events, Scholarship of Teaching & Learning by STEP Admin. Bookmark the permalink.